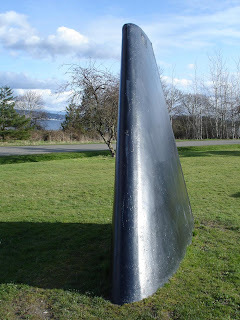 I shared with Ken the earlier picture from Magnuson Park, and he noted that he sailed on one of the submarines planted there! Ken sailed the USS Gato (SSN-615) from Pascagoula, MS around to Cocoa Beach, FL then up to Groton, CT. He believes it was around 1980. The USS Gato was a Thresher-class nuclear submarine, scrapped in 1996. Looking at the picture of the Gato before it was decommissioned, note the scale of the fins. They're the smallest feature visible out of the water, running horizontally. It's the same piece of metal as pictured to the left, where it is perhaps 10ft high. Not a small ship!